I never thought that earthworms could be a problem. I’ve only thought of them as being helpful not harmful! Holy, never occurred to me that earth worms are invasive. Someone get Matthew Broderick’s character from the Godzilla movie on issue this asap. I never knew earthworms were invasive. I had always assumed they were just part of the environment all over the world. Having an app for that is a smart idea! Who knew that a seemingly harmless earthworm could do so much damage. At least the worms are doing what makes them happy. When I was really young I liked wrestling and I found an earthworm and named him Austin. He lived in my house for 2 days (with trips outside, of course) until I decided to set him free. Probably cause my mom found out. Menh, I’m not too worried. If it’s becoming a problem for Quebecian maple trees we’ll be seeing a solution soon enough. I never thought worms could be such a problem! I kinda wanna see the movie tremors now. 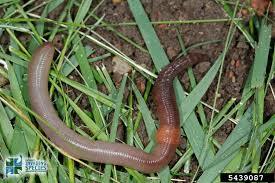 I thought these earthworms were a blessing to our ecosystem since the loosen the soil. It’s quite a surprise to see that they could also be invasive. Not pleased at all. How interesting! Even if they turned out to be a major problem in the territories, I wonder how we could go about erradicating them?? Hmmm? I always thought earthworms were beneficial for the soil.